Hike along the scenic ridge from the month of november to january, the entire landscape will be dotted w/ small yellow bell-shaped flowers of yellow cedar (tecoma stans), the virgin islands national flower. 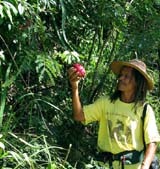 Each of the Eco Hikes given by Ras Lumumba will include a rambling informal lecture based on the species actually encountered, their properties (both actual and legendary) and the taxonomic latin names as well as the more colorful appelations by which they are known in the caribbean. Please Read what a tour participant had to say about Ay Ay Eco Hike & Tours.